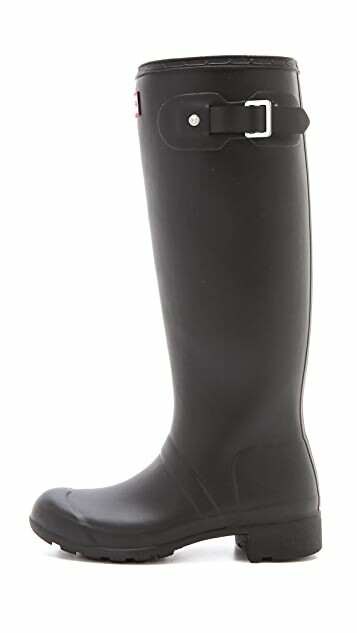 The original Hunter wellies in a cool, matte finish and a convenient, foldable design. A buckled strap accents the shaft, while soft nylon lining and a cushioned footbed offer a comfortable fit. Lug sole. 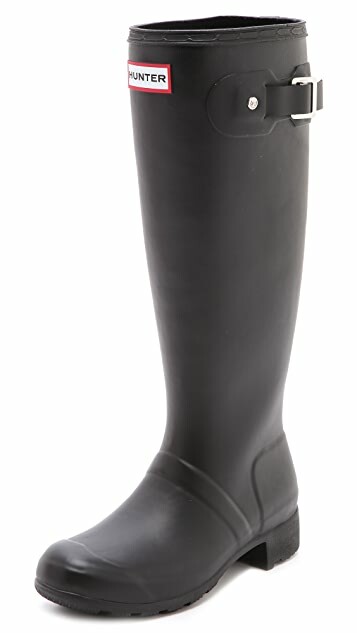 these are the best rain boots i've ever had. they're super comfortable since they're really flexible, and if it stops raining later in the day, i can just roll them up and put them in my bag. when you unroll them, they're not creased or folded; they look perfect! 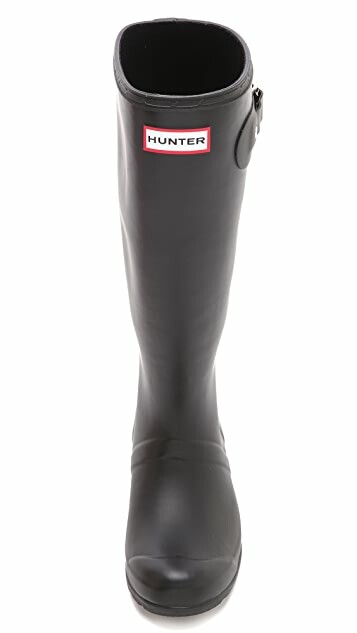 I've had 2 pairs of the classic hunter original boots. This packable one is more comfortable because its not as stiff and it really is packable and it comes with a bag that you can pack it into. Great buy if you travel to rainy places a lot. I purchased these because I am a student and I don't have a lot of room in my apartment for my boot collection. The packable feature is absolutely the best part of these boots. They also felt more comfortable than my other hunter boots. However, I thought they looked cheap and flimsy. I decided the convenience factor was not a good enough reason to keep these and they have been sent back. I've been waiting so long to get a pair of Hunter boots, now it's Autumn I finally have an excuse. They're exactly what I expected from the brand, they fit perfect around my calves, true to size, so easy to clean, they fold perfectly and fit perfect into my suit case. Perfect! PERFECT! Just got my boots today. The Original Tour is absolutely brilliant. It is very light rather than the original one, it doesn't crease after folding and very comfortable as expected. True to size, I'm a size 8 and it fits perfectly. As for ShopBop, very easy breezy transaction. Package came less than a week. 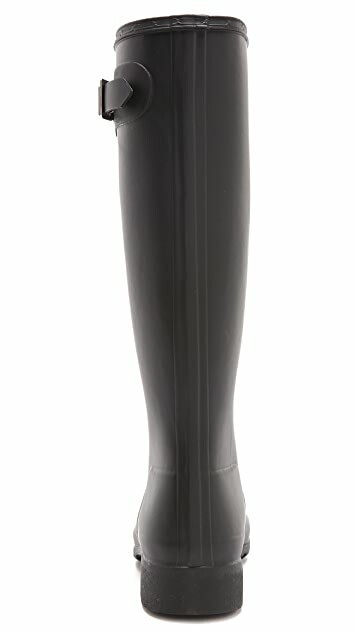 These are the most comfortable rain boots I've ever had!They are light and flexible which makes them easy to walk in. The sizing is as expected: I am eur size 40 and got these in us9/uk7. They fit perfectly! I've tried them on with a thin sock, however it feels like a bit thicker sock shouldn't be a problem. 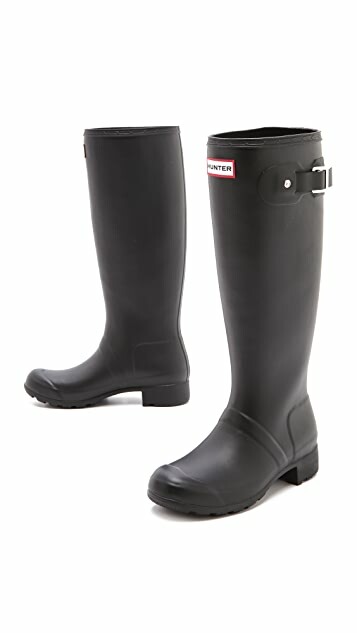 would be nice if they were a bit smaller around the calves, bu not a big deal.. great rain boots! I have searched high and low for gumboots that are appropriate for both farm wear & that aren't too embarrassing to wear to grab a quick coffee - and these absolutely fit the bill! Attractive to look at but most importantly they are incredibly comfortable. There's no squeezing these on or off - they just slip on & off (in a very good way) and fit perfectly. I have written larger than expected, as I suppose I expected them to be like every other gumboot - tight and painful - but not these Hunter wellies! I have worn them with thin socks, thick socks & even barefoot and my feet are thanking me for purchasing them. They are worth every dollar spent. They are incredibly comfortable - I highly recommend them. Also - they were delivered extraordinarily quickly - thrilled with that!